We’re going to make this one short and sweet — the Phillies, my beloved Philadelphia Phillies, just couldn’t do it this year. What was even worse was that they played the Yankees and I live in New York City in a new apartment building surrounded by Yankees fans. I just couldn’t face to finish watching the final game as the Phillies handed their World Championship title to the team with not only the richest ball players (who have won the World Series 26 times before) but also to a team filled with wanna-be celebrities (ahem, A-Rod – here doing what he does best, looking in a mirror and kissing himself and, ahem, Jeter) and actual celebrity “fans” and girlfriends (if I had to see stupid Kate Hudson, Jay Z or Rudy Giuliani one more freaking time…). Even though I slept with ear plugs in the night the Yankees won, despite my disappointment, I fell into a deep slumber with a belly full of smoky, spicy Chipotle Wings. A few weeks ago, Challenge Butter convinced us to take on some samples of their unsalted butter and create an appetizer using their product along with some Spice Island and OXO products that they so generously gave us. It was a way for them to not only get the word out on their amazing product (unfortunately, it’s only available to buy in the Western part of the US) but also on a great sweepstakes they are running until December 31st, 2009 to win a 7-day trip to Montana. 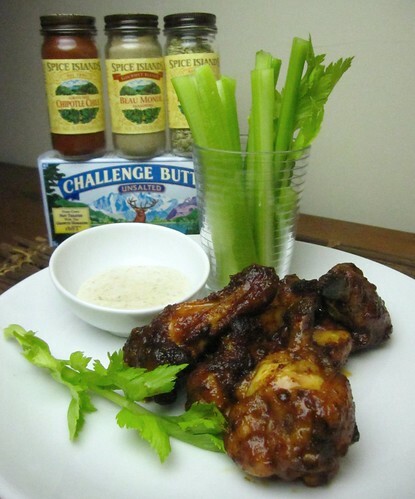 So with sports on the brain and the cooler weather coming in, we dusted the wings with some of the Spice Island spices and baked them Alton Brown-style till they crisped up, then tossed them in a blend of my obsession, La Morena Chipotle Sauce, some Tabasco chipotle-flavored hot sauce and some melted Challenge Butter. Dipped in some fennel-seed spiked Ranch dressing and the worries of my team losing the big game began to fade away – even if it was only temporary. Mix the spices together along with a pinch of salt and a pinch of pepper. Sprinkle on both sides of the wings. Follow Alton Brown’s directions for steaming and then baking the wings. Continue following his directions, but toss the chipotle sauce along with the Tabasco Hot Sauce and add to the melted butter. 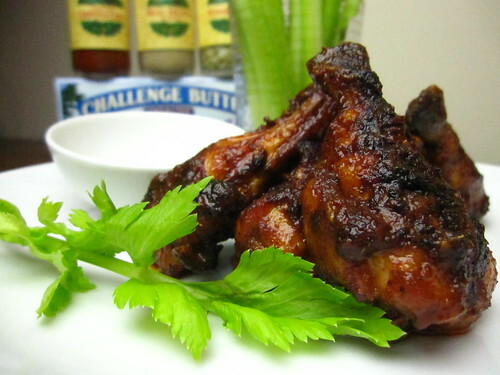 Finish by tossing the baked wings in this delicious mixture. Serve with some dipping sauce of ranch or blue cheese dressing and some celery. Also serve with copious amounts of beer. Would be perfect to make when the boys watch footballs. They look delicious. I was sorry about your Phillies too! Us New Englanders aren’t too crazy about the Yankees either. But those wings…. I’ve been thinking a lot about making wings lately. I was also wondering if brining or marinating overnight would help the flavor penetrate through the skin. With butter and chipotles, I can see how this would be a great recipe! Those look succulent and spicy! I’m not a huge wing eater, but I’d give these a try. Mmm…these look like sticky, spicy deliciousness. I’ve never been a sports fan, but I’m a HUGE fan of pub grub! Thanks, Tina! You’ve got me thinking that maybe I’ll add a touch of honey to this recipe next time, just to up the sticky factor. Mer-cy. Those look dangerously good. Isn’t it funny how we can mask the 1/4 cup of melted butter with the “unfried” thing? I love it! GLORIOUS. Pending for this weekend. The Phillies’ loss would have gone down a lot easier if I’d had some of these wings to console myself with… I haven’t had wings since I moved to Argentina. I’m definitely trying these! Me? I’m a Tillamook girl, but that’s cuz I’m an Oregonian. Challenge is a close contender with Mother’s for Best-Looking Butter Package, though, for sure. My tummy is gurgling hard for some wangs, now. Might hafta hit a BW3, though – I’m through with cooking/baking until this sprog is out. Not much of a sports fan here either… but game food is always so much fun. Love that smoky heat chipotles bring to the table… and I’m loving that fennel spiked ranch. Great idea! Heh. Heather wants wangs. And not the computer, neither. Condolences on your Phillies loss. I didn’t watch a single game of the Series this year, but when I was a kid, the Phillies were my team, back when Mike Schmidt was on the team. Your wings look spectacular! I don’t fry mine anymore either. I fire roast them brick oven style on the Big Green Egg. Wow, the wings look amazing! Baked, huh? I will definitely have to try them as I really can’t stand frying. The chipotle sounds delicious. I want to tell you my secret, here it is..
although I cook a lot of chicken, I only eat the wings, that’s it. The rest is for my family. So, this recipe of yours, is bookmark for sure. Looks utterly delicious Amy. Oh yum. I love wings. I also love chipotle powder. I need to try your sauce. GO YANKEES! Sorry about the Phillies, but this gal is from a Yankee family and only the best of the best win 27 times!! Woo hoo! Best of all, it pisses off the Red Sox fans. I disagree – only the best of the best have players that all cost them a ridiculous amount of money to purchase (which they can pay). the best of the best create a team together that may not be made up of the best of the best. money buys the best! 😉 can you tell i’m a bit bitter? as for this alton thing – well, you know my feelings on the food network personalities. the steaming did make them moist and the baking method did crisp them up on the outside. do i prefer fried wings? hell yeah, but these were good! Hey, I’m an Alton Brown fan and I have no clue how this steam-then-bake method of making chicken wings could have escaped me until now. Thanks for mentioning it, though, as I will definitely give this method and this recipe a try. I don’t know much about baseball, but I’m a chicken wing connoisseur. Great Recipe! I am taking the challenge too. Haven’t come up with a recipe yet though. Good luck! Those wings would taste mighty good on the Montana Ranch! Oh, it looks soooo American!!!!! He, he the closest to American food I’ve ever been here in Barcelona is at the Kentuky fried chicken… I used to love it (when I was young and didn’t have much money). Your wings look simply delicious with the sauce! I’ve had these at the pub and thanks to you both, I can know enjoy them at home….damn f-ing tasty!